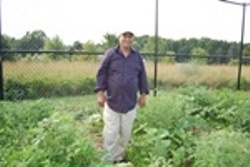 In July 2012, community partners committed to making Reston an even better place to live for all of its diverse community members introduced the Cedar Ridge Community Garden, a 30′ by 30′ piece of land gardened collectively by the residents of Cedar Ridge. The garden is maintained by the eight “Master Gardeners” and now just in time for this year’s growing season, the Cedar Ridge Community garden has increased in size to 30’ by 60’ feet for eight additional gardeners all of which reside in the Cedar Ridge Apartment community. The increase was made possible by a grant from the Fairfax County Neighborhood Enhancement Partnership Program along with many hours spent in the garden and at local budget meetings from the gardeners themselves. There are also two community plots that are being used to give back to the community through service learning and hands-on educational projects for the Community Technology Partnerships (CTP) after school and summer program for youth of all ages. Volunteer assistance is provided by members of Sustainable Reston, while Reston Association Parks and Recreation staff provide maintenance support for the garden. Cornerstones’ Community Building Initiative staff facilitate monthly Garden meetings and work with the community to identify gardeners and serve as a communication channel between gardeners and community members involved in this project and run the CTP afterschool and summer programs. Raising one’s own supplemental food is not only economical for Cedar Ridge residents, whose average annual household income is $26,000 (in contrast to Fairfax County’s nearly $106,000 average household income), but in the words of a Master Gardener, “Getting one’s hands in the soil and watching the produce grow is an uplifting experience which adds hope and joy to the residents’ daily lives.” The community garden fosters cultural awareness and a healthy lifestyle. Families spend time with each other working in the garden, engaging in physical activity and eating fresh produce. The Cedar Ridge community garden has brought a refreshing component to Cornerstones’ commitment to maintaining safe and caring communities. The garden’s mere presence and the day to day operation of it has grown into a natural and welcomed livable space.